If you are missing the duvet cover finale, know that I am too. 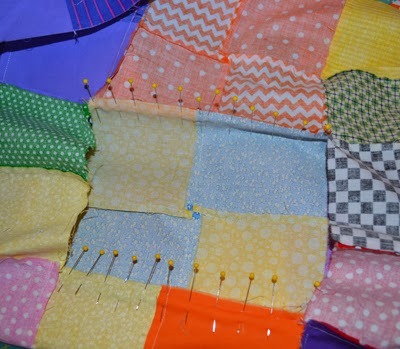 A few days before Christmas I was removing some of the blocks from my oldest daughter's cover, after all the patchwork was sewn together. I noted that the blocks that were more solidly black in color detracted from the center block that is also bordered in solid black. I picked them out and then replaced them with other blocks. 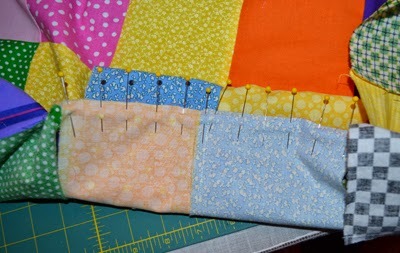 This was quite a feat considering that I needed to sew them back together in the same order that they had been originally sewn: sewing first the seams that would connect the block to the original row of blocks and then to the side seams as pictured below. By the last one, I had this technique down pat. I am purposely taking time to learn on these pieces. They are forerunners to what is ahead, and mastery of skills is key before advancing to other projects! 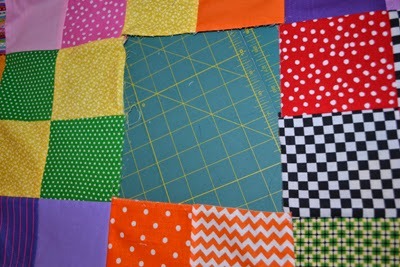 ....then I picked out the five blocks that had strong black in them. 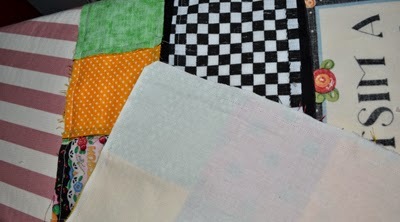 I sewed new blocks by sewing the seams in the order they were sewn before. Note that I am resewing this block into the row first. 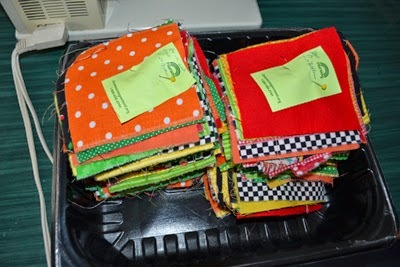 I then sewed the side seams, just as I would have sewed the rows together. I hope you can see that the pastel colored blocks don't detract from the center. 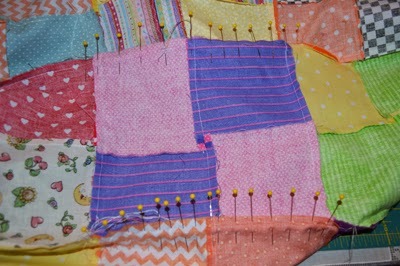 I started sewing rows of blocks together on the second duvet cover next, and then took time out for Christmas. I was grateful that my girls are being so patient about me finishing them, though I hope to complete them in the next week or so and will photograph the steps and their completion. I am planning the details as I go. 2015 is calling me to push forward and get these finished as I have many quilts to finish this year, all in various states of completion! Blocks stacked and ready for stitching, carefully marked in rows as laid out. 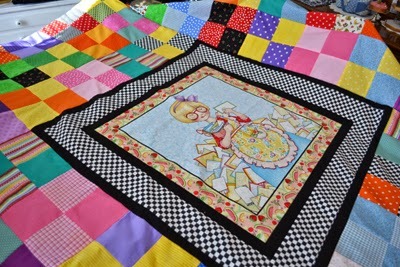 The center block all pieced together for the top of #2 duvet cover. 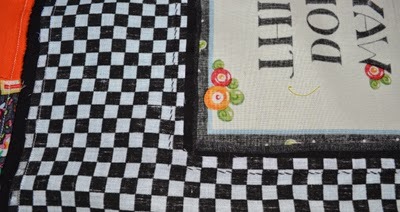 Back side of block to show appliqued center block to checkered fabric. Wrong side of center block with muslin back stitched front side to front side. The block backed with muslin now has finished side seams ready for applique. I hope you are like me, and are looking forward to the year ahead with many creative endeavors calling you as well! Life never seems to lack purpose when you are driven to create! I even have a new TV to keep me company as I stitch away. And check out this little ironing board that I found in our garage. It was one bought cheaply at a garage sale by my daughter when she was in an apartment and was getting ready to be thrown out. I cleaned it up and used one of the ironing board covers that didn't seem to fit my larger ironing board to make its own cover! What a handy little table ironing board. 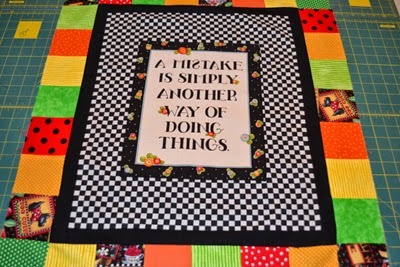 I am learning that when doing patchwork taking time to press as you go along is key, and since my room was a bit too full with the Christmas tree still up, I decided to try this little one out. I try to do my projects in steps and pressing strips before pairing them to another strip, will make the seams lay flatter and this little table top board seemed to be just what I needed to do that! 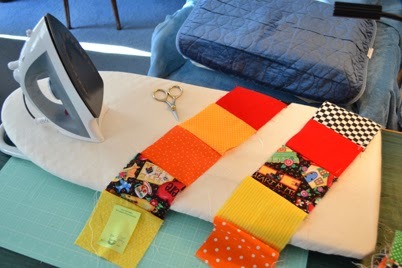 My garage-sale table top board works well to clip and press rows of blocks. My "new" old used sewing table, better sized than my first little fold up table. My sewing table was recently purchased and is one that my daughter and I found at a thrift store for $40. It was solid and bigger than the one that I had been working on, while still being small enough to move around in my living room. Fortunately my decor is shabby chic and so it fit right in. We think it had been a table in an old science lab, and would tolerate the abuse I would give it. I gave it a good clean so that none of its marks would rub off on any of my work and checked it for any roughness that might snag material. My husband sawed the legs to make it the right height for me. 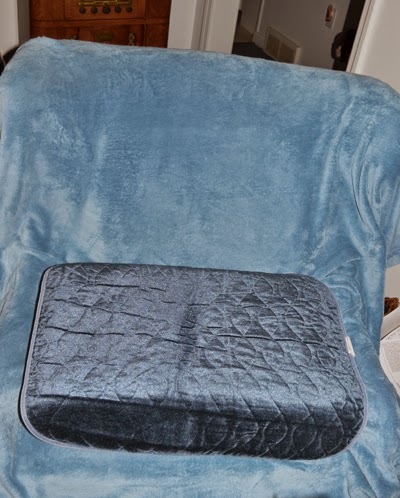 So far the most comfortable chair to sit in for periods of time is an old chair of my mother's that is padded, but firm, to which I have added a high density foam block to sit upon. I simply stuck it in a pillow case for now and then added a chair pad to the top. Perhaps I will create a fancier cover to it sometime to make it a bit more attractive, but for now it makes me comfortable and elevates me to sew which is a high priority. I tried elevating the chair first which wasn't so comfortable. Taking time to be sure that the ergonomics of your space are right for you will save you time and energy in the long run!! My improvised sewing chair...not pretty but it works! 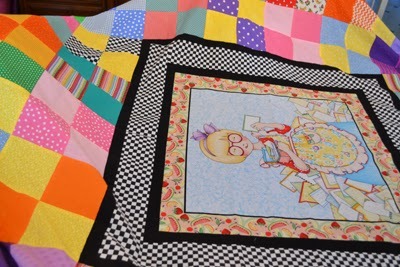 I am thinking that I may make some of my quilts as my mother did, quilting them in blocks or strips in a quilt-as-you-go fashion as working on big quilts is very awkward. These covers will remain awkward to finish up, as they are to be king-sized patchwork covers to cover equal size duvets. One is a feather duvet and the other a polyfil duvet according to my daughter's preferences. I found them to be less expensive than purchasing extra thick comforter batting. 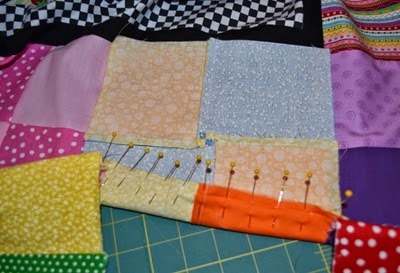 These will not be quilted or tied which made them perfect pieces to practice sewing patchwork, and each is designed and constructed a bit differently. They will be very practical bed covers as they will be easier to launder by simply washing the covers and won't require taking them to a commercial washer, though their duvets may need washing occasionally in an oversize machine. 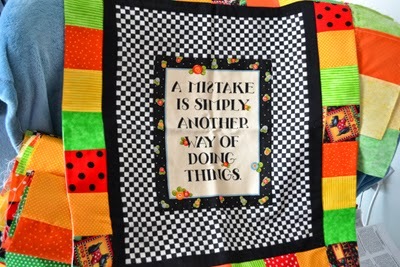 I have learned on these projects that indeed, "mistakes do create other ways of doing things"! 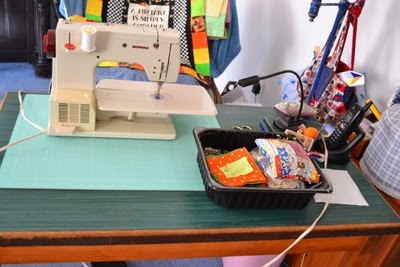 Labels: Making patchwork duvet covers, removing and replacing quilt blocks from tops AFTER they have been sewn together; table top ironing board option, sewing room ergonomics.